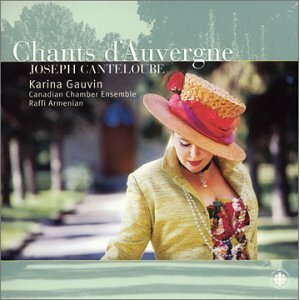 We can’t stop listening to Karina Gauvin’s recording of Josephe Canteloube’s Chants d’Auvergne. Summer on a CD is what this is. Canteloube studied folk songs of Auvergne and reworked them into the multi-volume Chants d’Auvergne published 1923-1955. The texts are simple songs of shepherdesses, rivers, cuckoos, outsmarting a male passer-by, unrequited love and stolen kisses, but what matters more is the musicality and strangeness of the language they’re written in. Auvergnat or Auvernhat is one of the many languages that had to die in order for the one national French language to emerge, a dialect of the former Occitan states which were gradually conquered, Catholicized (adieu, Cathars) and Frenchified. The language, with its Spanish, Portuguese and French ingredients, confuses you at every turn. There is nothing simple — or even particularly folk, about the music. It is utterly gorgeous, bursting the way the nature does on a summer afternoon, with cicadas, the buzz of the flies, wind swept crowns of trees, birds in all kinds of arrangements choral and solo, sounds of water ranging from the sparse drops to the force of the spring river, the entire sublime symphony. 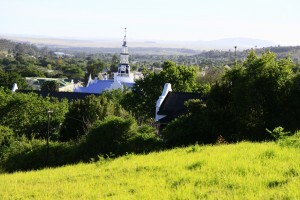 It is just perfect for a summer afternoon at Augusta de Mist in Swellendam. In fact, while listening to it, hearing the cooing, chirping, buzzing, squawking and general garden-life, simply enhances the experience. Part of the magic is the chamber ensemble, in this case The Canadian Chamber Ensemble formed in 2002 by the 16 principals of the Kitchener-Waterloo Symphony. There are amazing instrumental solos and leads all over the score. The woodwinds are often the absolute stars: there are solos which you can easily imagine in Tristan und Isolde. This Swellendam meets Auvergne is golden. Like our sunsets.